Henry Fisher was born on 15 August 1815, the fourth child of William and Frances, née Chessall, at Southampton Place, St Pancras, London. On 20 December 1834 at St James church Sydney he married Amelia Selina, daughter of George and Diana Breillat. They had a son William Henry, born in 1838, and a daughter Frances. Amelia died in 1865 and in 1886 he married a widow Emily Smith. He died on 24 August 1888, and is buried in the Old Church of England Cemetery at Rookwood. Henry Fisher arrived in Sydney on the barque Arab on 19 March 1832, with a letter of introduction to the NSW Customs Department. He set up as a Customs Agent and a wine and spirit merchant in lower George Street. In November 1842, he moved around the corner to Argyle Street, renting four floors of the Customs House Buildings from Frederic Unwin. On his return from a visit to Launceston in 1843, he offered kangaroo skins for sale as well as bran and wheat. In 1845, he set up Fisher’s City Depot on the corner of George and King Streets where his advertisements for Fisher’s Colonial Rum became well known. His private residence was initially at Princes Street and later Cumberland Street, The Rocks. By 1850, Henry Fisher, JP, wine and spirit merchant, was back at 480 George Street North. His son William Henry, who became a Master Mariner, joined him in the brokerage and Custom House Agency at 8 Castlereagh Street North in 1867. He was also involved in coastal trading and owned several vessels including the cutters Endeavour, Fanny Fisher and the Amelia Breillat. 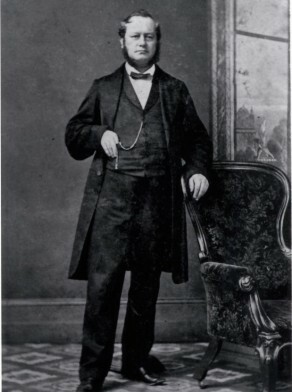 Fisher became Councillor for Gipps Ward on 1 November 1844 and retained his seat until 9 February 1853 when the Council was replaced by a three-member Commission. In 1853, he took civil action and claimed damages against the Sydney Morning Herald for implying he was ?under the influence? at a council meeting. He lost the case.